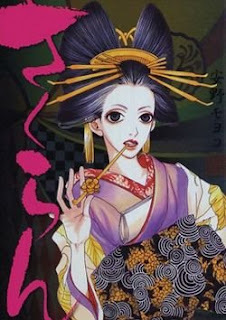 花魁　A reader's comments reminded me to post about the lavish and visually gorgeous movie Sakuran, about a courtesan in the Yoshiwara pleasure quarters. Except rather than being a stuffy period drama, it is filled with swearing and catfights and feels more like a racy carnival. The movie came out last year but I missed it while it was at the theatres. Thinking I was going to go see it however, I bought the manga it was based on by Moyoko Anno. I'm not interested in manga, I never have been (nor comics for that matter). But I couldn't resist the cute purple-edged pages and glossy cover. I also wanted to see how the clothing of the period was drawn and how it compared to ukiyo-e. Until I opened the manga to the first page, it had never occurred to me that I don't actually know how to read manga. Japanese words I don't know can be easily looked up but having never read one myself, I was lost. Where do I start reading? How do I know which box to look at next? Who's saying what? I had a newfound awe for students I've observed reading manga on trains. The medium is largely pictures I know, but the speed at which the pages were turned was impressive. They were devouring the small volume within a matter of minutes. I asked the beau and he said "just read it". Thanks. for. the. insight. It was so disconcerting not being able to just dive in and read it! After I few half-hearted attempts I flipped through the pictures and left it on my shelf. Fast-forward to a few weeks ago when I finally watched Sakuran when it was on tv for the Sunday night movie (I think they edited parts out?). From what I could understand I was hooked. I certainly liked the cinematography and costumes. The story was easy enough to sort out with the beau's help but they were speaking old skool Japanese and with lots of rough rolling Rs. I ordered the DVD on Amazon and it arrived last week! Watching it with English subtitles cleared a lot of stuff up and now I can watch it in Japanese with Japanese subtitles (oddly helps seeing the dialogue). The story line is nothing new and quite anti-climatic which seems to be pretty characteristic of movies and dramas on this subject matter. It has a rocking soundtrack though (unfortunately not released) and as I said before, it is sumptuous to watch. 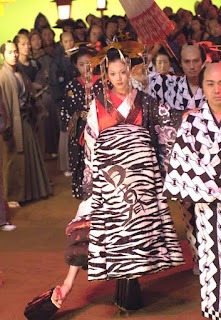 Not only the costumes but the use of colour, the floating feeling throughout using a goldfish theme and the slightly modern pop-ish feel to the architecture and interior of the Yoshiwara are enough for me to watch it again. And again. I thought Anna Tsuchiya was tres cool in this film but have just read an interview with her in which she says she really enjoyed the Passion of Christ among some other things that make her look like a bit of a flaky idiot. I'd like to think that due to poor translation she didn't "get" the film but she has definitely gone down a notch in my books. While I'm on a roll with the pleasure quarters, Kei Kumai's the Sea is Watching should be up next. Gonna look for this movie. Thanks for the tip!